FMCSA has granted a waiver to allow alternate cargo securement methods for certain agricultural commodities. The Federal Motor Carrier Safety Administration announced in a Federal Register notice published April 15 that truck drivers hauling certain agricultural commodities can now use alternate methods for cargo securement. FMCSA granted the waiver to the American Trucking Associations’ Agricultural and Food Transporters Conference, which requested the exemption in January 2018. The waiver allows for alternate securement for agricultural commodities transported in wood and plastic boxes and large fiberglass tubs, or for hay, straw and cotton bales that are grouped into large singular units. For wood and plastic boxes and bins, AFTC proposed they should be secured by perimeter tie-downs used in pairs with corner irons, along with blocking at the front end of the trailer. Trailers 32 feet long or less would also require the use of at least one lateral tie-down in the center of the trailer, AFTC proposes. Trailers longer than 32 feet would require at least two lateral tie-downs. The group also proposed that fiberglass tubs be secured with at least two perimeter tie-downs – one attached near the front right corner of the trailer crossing diagonally to the left rear corner of the tub, and one attached near the front left corner of the trailer and extending to the right rear corner of the tub. Finally, baled cotton, hay, straw and other similar commodities in horizontal bales would have to be secured with at least two parallel longitudinal tie-downs over the top of the load and by at least four cross tie-downs if loaded more than one tier high. 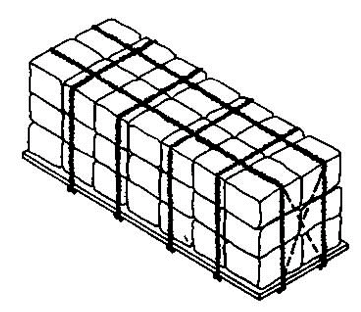 Vertical bales would have to be secured with two perimeter tie-downs. If stacked in two tiers, the group proposes two longitudinal tie-downs that extend over the top of the load and at least four cross tie-downs. A more detailed breakdown of the alternate securement methods can be found here. The waiver is effective through April 15, 2024.